High Throughput Pipetting There are 2 products. Liquidator96 pipetting system is a powerful personal research tool for all laboratories. Accurate and efficient, Liquidator96 is designed to maximize workflow, without the need for complicated programming or dedicated technician time. Incredibly fast, Liquidator96 adds outstanding quality features to high throughput pipetting, with many applications. 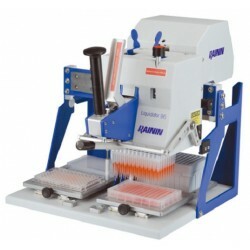 The Semi-Automated Benchtop Pipettor is a liquid handling device for pipetting into 96 and 384-well plates.